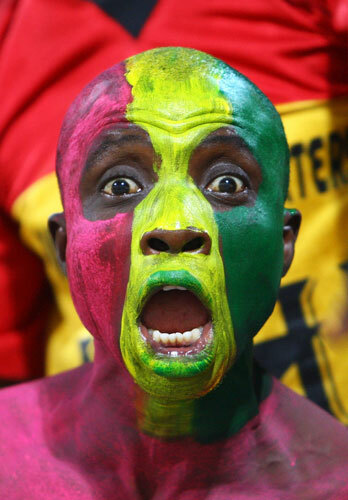 The photograph is of a soccer fan from Ghana painted for a World Cup qualifying match. We see the bright colors and his intense expression simultaneously. The image is vivid, striking, both festive and elemental, and it reverberates with shock, surprise, and dismay without registering any one of those reactions with any certainty. Whatever he actually was feeling, there is no doubt that this was a moment of intensity. You can see why it would jump out of the thousands of thunbnail images on a photo-editor’s desktop. For all that, the photo also is thoroughly conventional. The slide shows at the major papers are full of such images throughout the various carnival seasons–and if the news is slow otherwise, there always seems to be a carnival somewhere. Hindu holy men, Russian street performers, Brazilian revelers, American kids at a state fair–wherever vernacular life meets art, someone’s face is going to be painted. 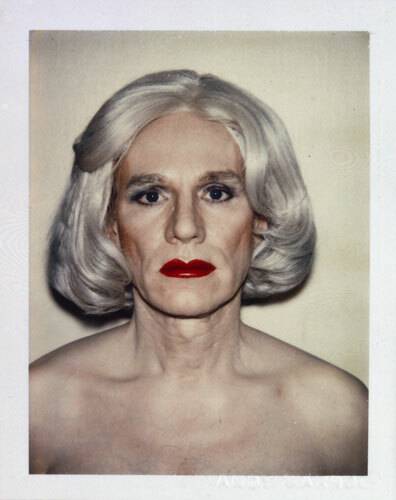 This self-portrait of Andy Warhol in drag presents another painted face, and the difference between kitsch and art. I generally avoid that distinction, which I see as one of modernism’s least impressive and most overused ideas, and I don’t want to demean the first photograph, which suffers by being put into this unusual comparison. But, my God, what a difference between the two images. As before, we see the expressive face and the artificial colors simultaneously. Instead of the momentary frenzy of a sporting event, however, we see a lifetime of pain. Instead of intensity (alone), here the paint (and wig) ironically evoke the powerful imprint of duration. As in, I’ve always been this way, always had to carry this inside, always. Although still a striking incongruity, the juxtaposition of male face and female makeup fuses into something that is at once the facial mask of a social type and the naked revelation of an individual soul. But who’s soul? The power of Warhol’s photograph comes in part from the realization that you could be seeing one of the many gay men who have been crushed in the closet, or one of the many transgender individuals who feel trapped in their body, or one of the many women who also have become fused to a mask of silver hair and red lips that promised happiness but is good only to put a face on their suffering. Because the photo was taken with a Polaroid, there is a hint of pleasure betrayed (just as in the first image above), and a blurring of the line between high and low media (and so of art and kitsch) in order to evoke a common experience. Although a remarkable work of art, the image is still a photograph, and so it reminds us that what it shows does not happen only once. Whether the image portrays the individual artist or a social type, we are seeing pain that has occurred again and again. Photographs by Julian Finney/FIFA-Getty and Andy Warhol/The Andy Warhol Foundation for the Visual Arts, Inc. The photograph is on display as part of the exhibition Polaroid: Exp. 09.10.09 at the Atlas Gallery, London. I have to agree that these two images illustrate completely different messages although they both highlight the use of paint and color to draw attention to the main subject, where the first image captures the intensity of a sports fan and the second image captures the frustration of ionic artist, Andy Warhol. However, where the sports fan wears makeup to standout and celebrate comradery, I think Andy Warhol covers himself in makeup for all intents and purposes of concealing his true identity, his manhood. He hides beneath a silver colored wig, bright red lipstick, black chalky eyeliner, and caked on face powder. This female disguise represents another side of himself which he longs to identify with however Andy is presented with the significant obstacle; he is and always will be a man. And even though Andy is made up to disguise his true identity, one can witness the fact that he still must live day to day without ever feeling complete due to the frustration and melancholoy expression on his face. These two portraits represent abstract art in that the portraits focus on the material in this case it’s the makeup on Andy and the paint on the sports fan that capture the viewer’s attention. To prove my point, it did not occur to me at first that the portrait was of Andy Warhol disguised as a women because I was so focused on the makeup. The makeup clearly distracted me from the reality of the portrait. The act of pretending to be something one is not is a regular occurrence in our society. People do this on a regular basis, however in these photos a new sense of identity is portrayed through art, I agree it is a form of abstract art. In the first image the idea of pride and team spirit is apparent. This image shows the great deal of excitement the man has for his team. This image is something that is not out of the norm for those whom put their heart and soul into their favorite teams. The vivid colors give a sense of joy at first glance. Looking deeper into the image we see pure enthusiasm from the man, identifying pride and a sense of belonging. However, in the second image I see pain and hope of belonging. This is not a uncommon thing for men who may be straight or homosexual to feel like they are not able to express who they really are. The white hair and makeup give a sense of emptiness and the red lipstick identifies a fierce women. The two together give the idea of a person trying to belong in a world that doesn’t fully feel excepted, a man that feels he would be more confident if he were able to be the person on the outside that he feels he is on the inside. Both of these images are very powerful and represent the idea of belonging.